Come join the fun! Fantastic year end awards for AzQHA members. Select (riders over 50) all skill levels, both Quarter Horse and All Breed -in one class! Must be a member of AzQHA to qualify for year end awards for this class and do not have to join AQHA for the Select class. New members must be a first time AzQHA member. Must purchase a regular or youth membership for current year. It is asked that the new member have never shown in the Quarter Horse classes at any No Bling show. New member will receive $100 in “Show Dough” to use for stalls and or entries at any No Bling show or AzQHA Trail Challenge. Card may be used at multiple shows until the entire $100 is spent. The Show Dough card may not be used at the Sun Circuit, Fall Championship or EMO Western States shows. Show dough credit is only good for the year the membership is purchased it will not roll over to new year. Above date location is at Grand Adventures Ranch in Sonoita. AQHA horses must furnish copy of registration papers and riders MUST be a current member of AQHA. Memberships can be purchased at ride site. Riders and horses are scored at each obstacle on a scale with 70 being the average. As in all Quarter Horse Judging 70 is considered the average and you will plus or minus from that figure. You know exactly what the faults will be and when you will be given a plus score. This can be found on the AQHA web site @ AQHA.com and go to the riding page-look under Trail Challenges. 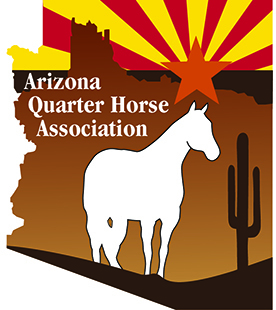 ALL BREED Riders MUST be a member of Arizona Quarter Horse Association (AzQHA) to get year end awards. ALL riders and handlers must wear long sleeved shirts, boots and hats or helmets. All tack must be safe and proper for discipline. English riders use English tack — western riders use western tack. Snaffle bits are to be used with two hands, shanked bits of any type are to be use with one hand only. Halters, mechanical hackamores or any other type of bit described by AQHA as not proper equipment will not be allowed. Horse showing major signs of lameness will be excused. Roping reins, tie downs, running martingales and cavesons/nose bands are forbidden. All riders will be checked for safe equipment before entering course. An adult must accompany children under the age of 15, no exceptions. These rules were created by the American Quarter Horse Association and the Arizona Quarter Horse Association to make every ones ride safe and fun. We ask that you abide by these rules for all of our safety and most important we want you to have fun and enjoy the beautiful Arizona sun with your horse and you testing your skills to advance to the next level. You will choose the level that you feel comfortable riding and to earn a year end award you must stay at this level all year. There will be two sections AQHA and ALL BREED and both will be leveled. IN-HAND- Horses will be lead thru obstacles. Any breed any size, any age, but may not be RIDDEN in a Trail Challenge during the year. Pre-Entries and payment should be mailed in before at the Trail Challenge and all riders will be given an Obstacle map but we will not walk the course prior to starting. Riders will be whistled off the obstacle if they refuse an obstacle or appear unsafe to continue. Each rider will be given 3 refusals at EACH obstacle. A refusal is when the horse steps backwards and/or refuses to cross obstacle. Each horse and rider will be judged on 16 obstacles and no horse/ rider combo that does not complete the whole course shall place over a horse that does 16 obstacles. A fall of horse and rider, at any time during the judging, will be considered as out of the competition and cannot complete the course. Before the start of the competition an obstacle will be chosen by the judges as a tie breaker obstacle. In the case of a tie, the horse rider combo that scores the highest on this obstacle will break the tie. Horses with bloody mouths or sides will be asked not to participate in the competition. All obstacles are natural as might be seen on the trail or a working cattle ranch. Walk over bridge, side pass logs, walk over logs, walk along planks, weave thru rocks or brush, back into an area and out, carry article from one area to another, open & close gate, walk thru water, walk into ditch, back down an incline, retrieve mail at the mailbox, mount with mounting block, dismount, ground tie, pick up feet, put on and take off slicker, log drag, and any other natural obstacle that we can find. You might see live animals such as a goat or donkey alone the course. We do not use mattresses in any form, plastic bottles, pool noodles or any object that we deem unsafe for horse or rider. Safety is our primary concern and if at any time you are concerned with the safety of an object, please talk to one of the set up crew regarding your concerns. The course is ridden before anyone is allowed to participate or enter the obstacle. The goal of the AzQHA Trail Challenges are to have fun, gain horsemanship skills, have more fun, and for you and your horse to become a team that works together to solve problems and improve your seat and hands. Trail Challenges can be fun for the whole family as one horse can be used by different riders at different levels. Pen fees and camping fees are set by the host ranch and vary. AzQHA will offer several events throughout the calendar year. Every Trail Challenge & Trail Ride will encourage fun, safety and education for every rider. The purpose of the Trail Challenge Program is to promote good horsemanship skills and provide an educational venue for members of the Arizona Quarter Horse Association. A Trail Challenge tests a horse and rider on their ability to work as team and navigate obstacles which they might experience on a trail. Each horse and rider is judged as a Partnership, navigating many situations. Recognition will be given to exhibitors and their horses.